Didn't want to overload you all with too many figure posts yesterday but if you keep tabs of my store's inventory, you might see that I snuck in a brand new Bishoujo figure release. Yes, the great artist Shunya Yamashita is at it again with TWO new figures of an American comic book beauty, once again proving that the Japanese do it best. 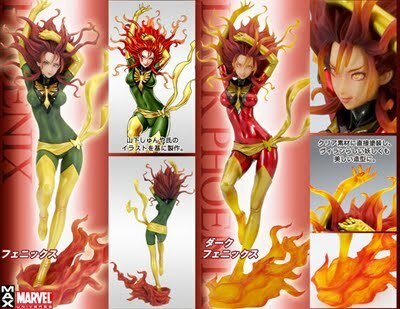 Announced yesterday was both the Phoenix and Dark Phoenix X-men Bishoujo figures. They are scheduled to come out some time in June or July and Jean Grey never looked so good.